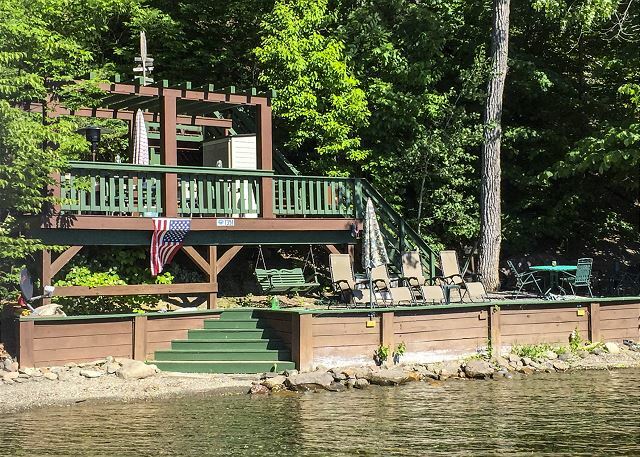 This immaculate three bedroom lake house is perfect for your family vacation. 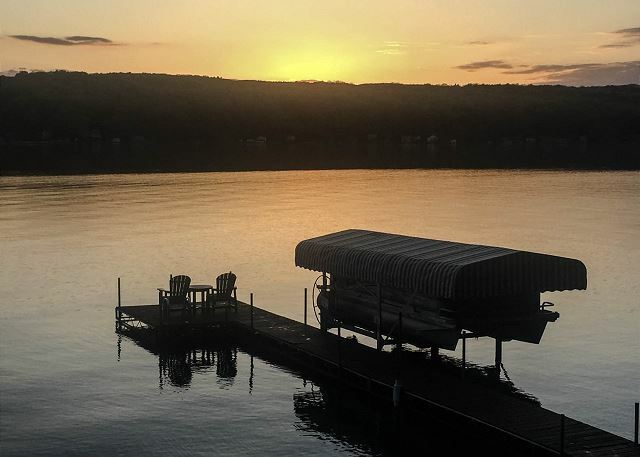 Located on the scenic West Bluff of Keuka Lake, Loonar Landing is nestled in the woods. 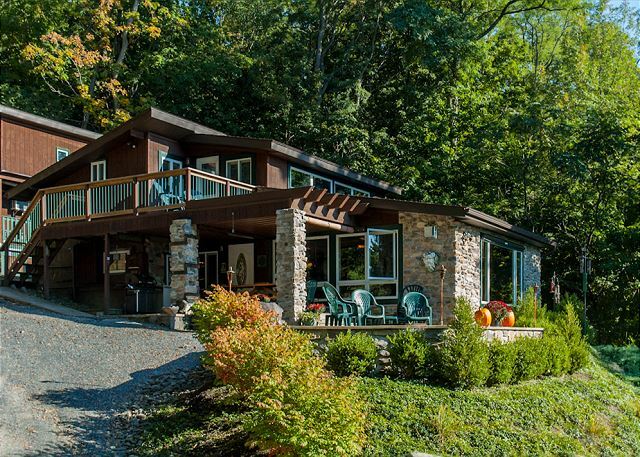 Enjoy the private setting and gorgeous lakefront with spectacular views. 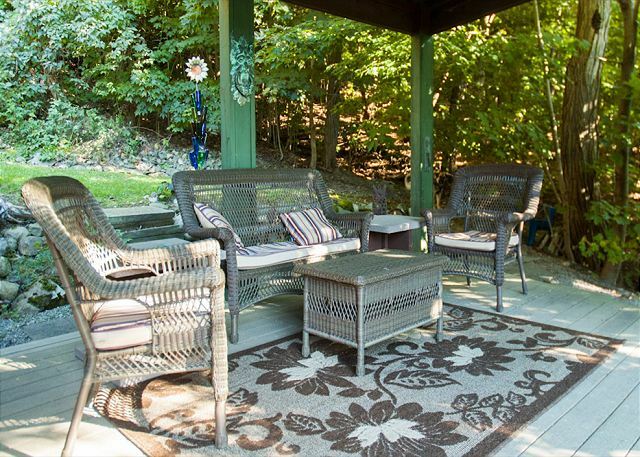 Surrounding this home you’ll find beautifully landscaped grounds and ample outdoor living space boasting two decks off the homes second story, two covered decks off the main level, and two decks going down to the lake frontage. To help make your parking accommodations easy drive right up to the main entrance of the property. Loonar Landing offers 4 vehicle parking spaces. As you enter you will be greeted by a large great room. 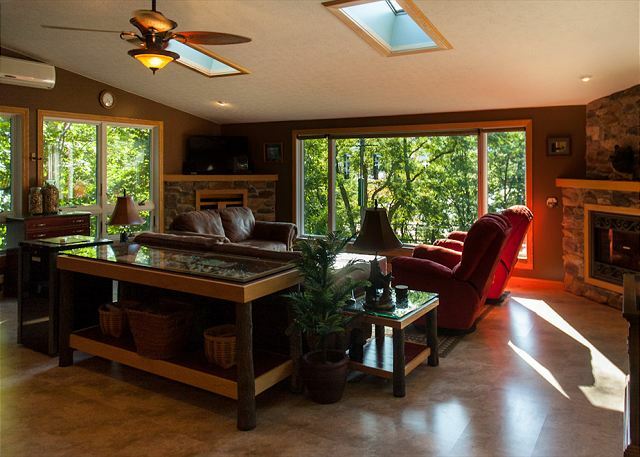 The living room area offers beautiful lake views and includes a large 42'' flat screen HDTV and surround sound system. 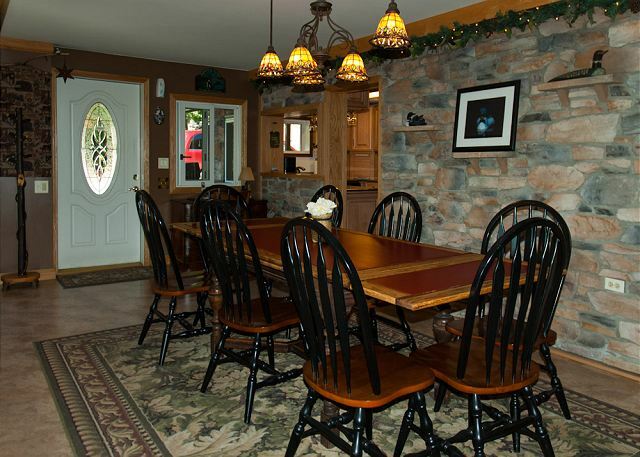 The dining area has plenty of seating for all of your guest entertainment and includes a wine chilling refrigerator. 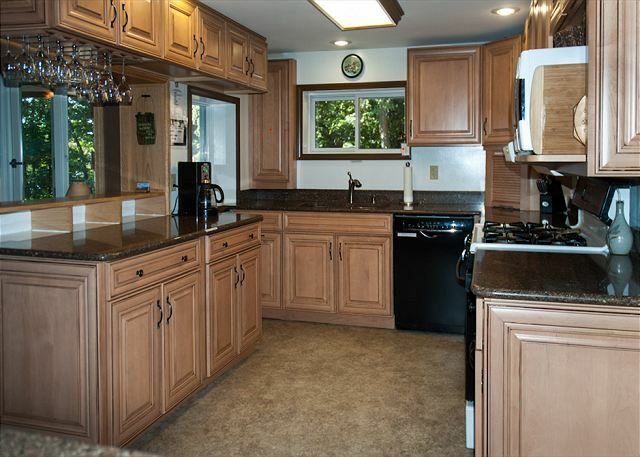 The newly remodeled, galley kitchen is perfect for preparing meals. You'll find it quite convenient that the fridge comes equiped with an ice maker! 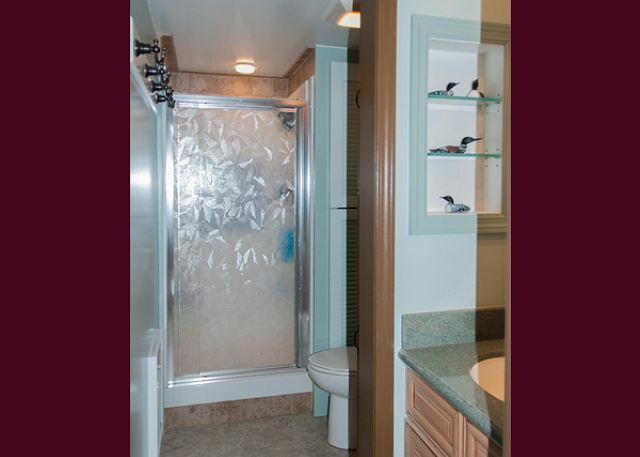 Venture beyond the kitchen and you will find the first bathroom with a stand up shower, commode, and sink. 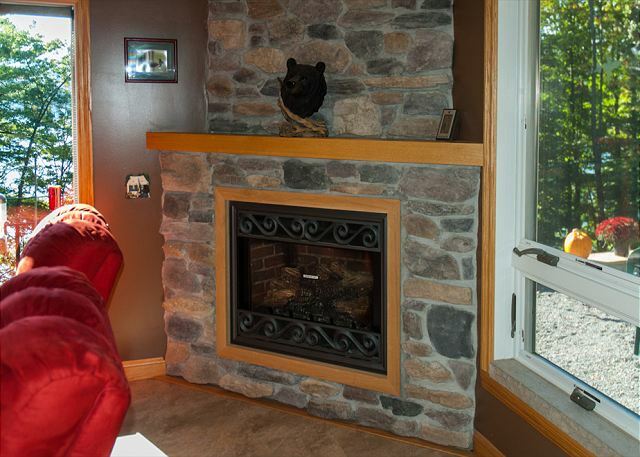 Directly across from the bathroom there is a charming sitting area with TV, gas fireplace and bar with seating for two. 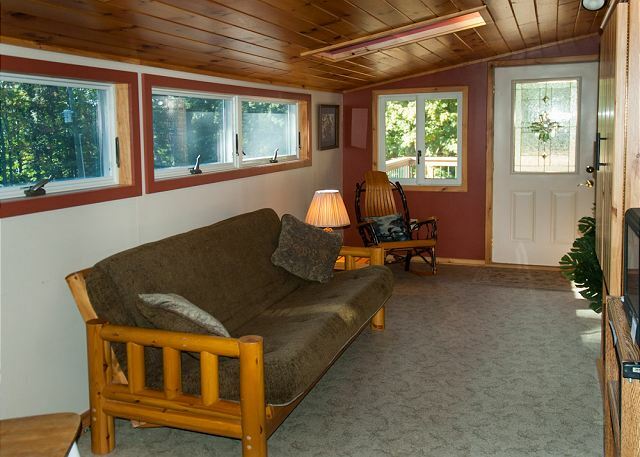 This is commonly referred to as the “Kid’s TV room.” Next to the sitting area you will find the first floor bedroom. 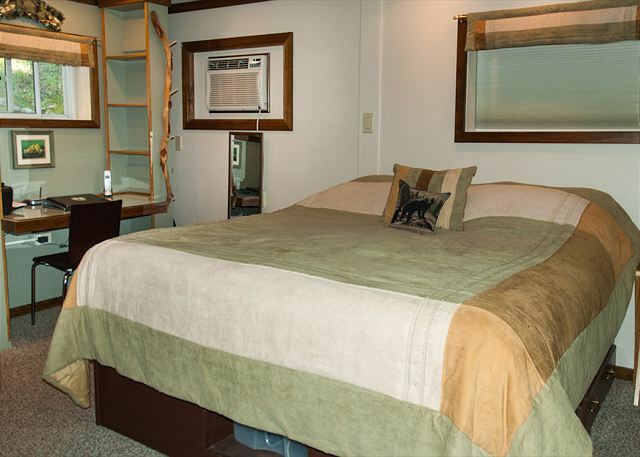 The room is complete with a king size bed, desk area, flat screen television, and a picturesque view of the lake. From the living room you will be entranced by a custom oak spiral staircase leading to the second level of the house. 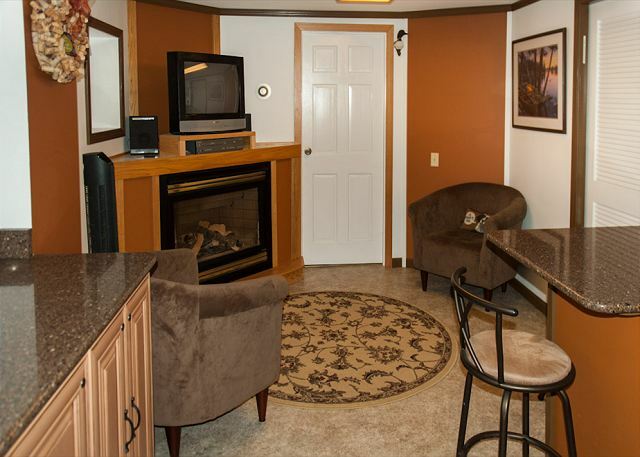 This level has two bedrooms, a half bathroom and comfortable seating area complete with TV and DVD player. 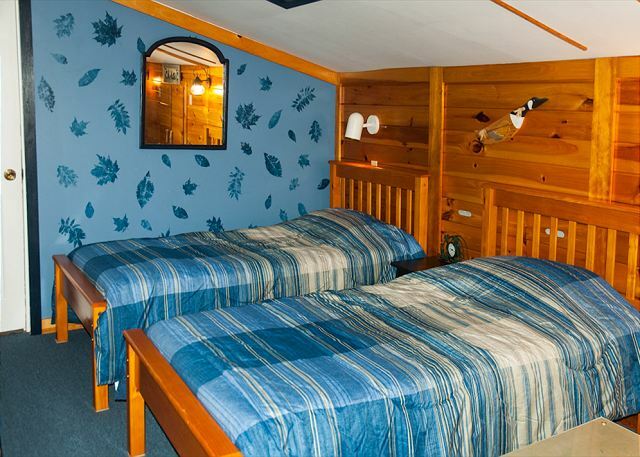 The first room is a uniquely decorated pine bedroom boasting a queen size bed and two twins. 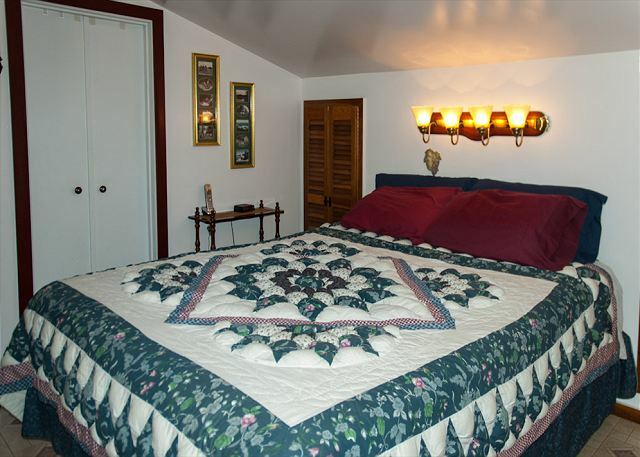 The second bedroom is decorated in a Finger Lakes grape theme and is equipped with a queen size bed, and a half bath that houses the washer and dryer. Off the second floor you will find two separate open air decks, each accommodating seating for two. End the night with a glass of wine and enjoy the sunset! 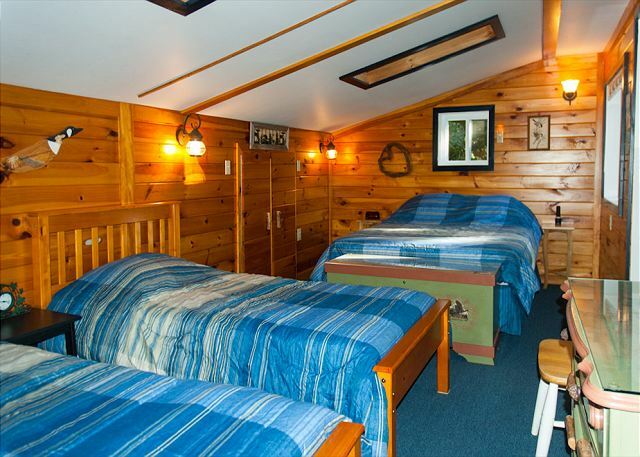 Loonar Landing is equipped with two covered decks, both with a mini-fridge, for your entertainment. 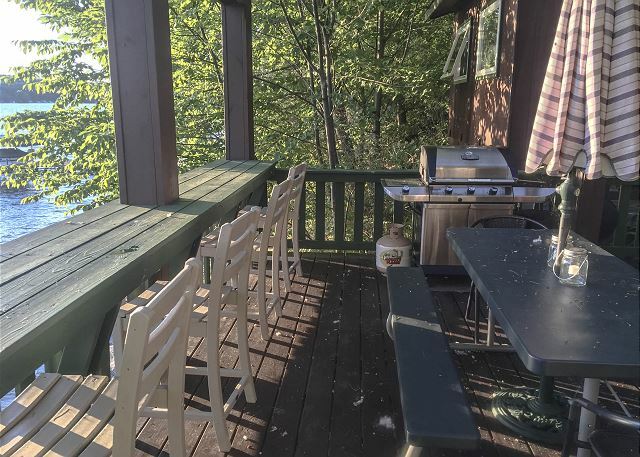 The deck to the north includes your main entry door and has a large picnic table and gas grill for you to enjoy outdoor dining. 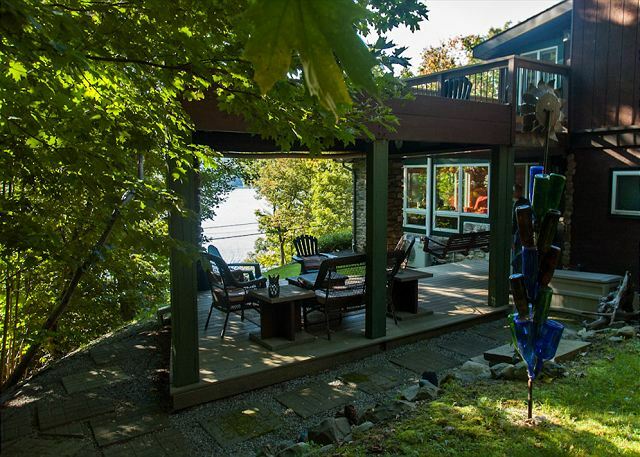 Off of this deck you will find an open air patio to enjoy stargazing and beautiful views of the lake, seating for 8. To the south you’ll find the second deck located in a beautifully shaded area, complete with a seating area and a swing. 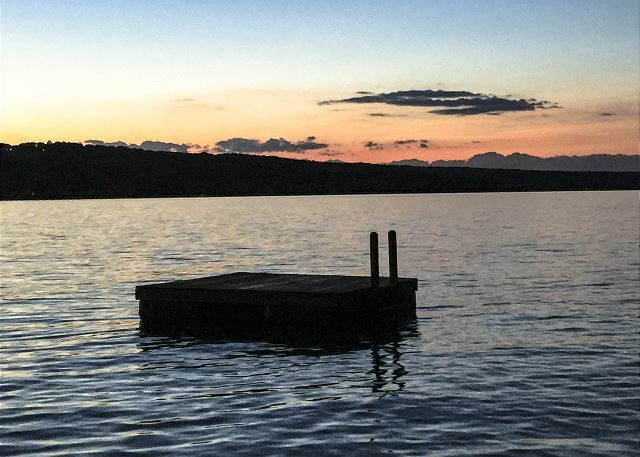 After only a short walk to the waterfront you will be greeted with over 109 feet of lake frontage. It is here you will find a full size refrigerator and gas grill, perfect for the grill master of the group! 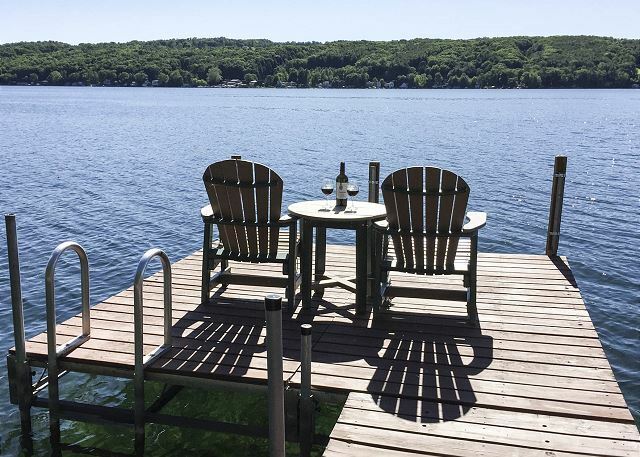 Two deck tables with umbrellas provide the perfect shaded area for your meals with a lakeside touch. Kids will love jumping off the swim raft!